This weekend's PCG Q&A is about the games that never were. In this weekend's PCG Q&A, we're talking about the games that never made it to release. Below, we've picked games that didn't ever see the light of day, but that are well-known through either old marketing materials or because the story of their development has since been told by other sources. We'd like to hear your answers to the question in the comments. What's your favorite vaporware? It could even be a port of a game that never made it to PC, or a game that became something totally different midway through release. I definitely wouldn't prefer a timeline where Arkane's Prey was scrubbed from existence and we only got Prey 2, but its premise was really intriguing to me: you would've been a bounty hunter with the atrocious name of Killian Samuels, freerunning your way across a cyberpunk city to kill your targets. The game was meant to come out in 2012 but by 2014 had been cancelled. It was previewed by the press and everything, and it sounded great on paper. The screens offered snapshots of a gorgeous-looking sci-fi setting, with weird aliens wandering around. And it would've had this impressive twist where every time you died you took on the role of a new clone of yourself. Oh well. Maybe Cyberpunk 2077 will scratch the same itch. 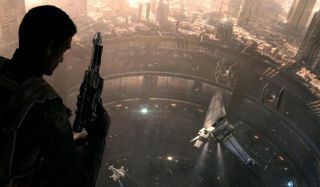 On another note, I was pretty excited about Star Wars 1313 for a while, but only because it was a particularly Star Wars-starved time in the early part of this decade, before Disney brought it back to life. I don't see what EA had to lose by releasing it, assuming it was anywhere near done. It was described by DayZ creator Dean Hall as a game that was not a game, which I guess is still true since Ion still isn't and apparently won't ever be a game. We didn't know much about it other that is was an emergent MMO inspired by Eve Online, Minecraft, and Space Station 13. Ion was announced at E3 in 2015 but we learned in 2017 that it was no longer being worked on. Mostly, I was just curious about it, especially because an early build contained a glitch where a player's internal organs could all fall out when you clicked them. That piqued my interest. Years ago I worked on an article about Maverick Hunter, an FPS spinoff of Mega Man X that was canceled at Capcom when Keiji Inafune left, and all things Mega Man became scorched Earth for a few years. The game never got the green light to enter full development, and based on the reactions to the early demo footage when the article came out, I think most fans thought it was an ugly, edgy abomination. I still would have loved to see that game exist, largely because it was being developed by Armature Studios, a development house founded by the key team behind Metroid Prime after they left Retro. No one thought Metroid made sense as a first-person shooter until they played Metroid Prime. Could Armature have done the same for Mega Man? I think there's a good chance. Maybe it would've been the tryhard Shadow the Hedgehog of the Mega Man universe, but I think that back in 2010, just a few years after Metroid Prime 3, that team could've built a great game that reworked Mega Man as efficiently as they'd reworked Samus with Nintendo. But we'll never know. I love Obsidian and I love the Alien universe, so it stings extra hard that this was cancelled. Admittedly, the footage that leaked made it look a little too combat-heavy for my tastes, but I think Obsidian could've done something more interesting with this universe than most studios. Features included characters dying permanently or getting face-hugged, customisable marines, and a story that expanded on the relationship between the Engineers and the xenomorphs. Apparently Sega execs thought Aliens wasn't suited to an RPG and canned it. But hey, at least we got Aliens: Colonial Marines instead... oh. I'm a huge fan of post-apocalyptic RPGs, going all the way back to playing the original Wasteland on the C-64. It took decades before we got an official sequel, but the Fallout series did a great job as a spiritual successor. Fallout was everything I wanted from a Wasteland-style game, and I loved both it and the sequel—possibly I was just starved for this sort of game after a 10-year drought. Fallout was released in October 1997, and the sequel arrived just one year later. Van Buren was the codename for the third entry in the series, but it was canned in 2003 with the closure of Black Isle Studios and the bankruptcy of parent company Interplay Entertainment. We did get an eventual sequel with the sale of the Fallout rights to Bethesda, but it didn't use the Van Buren plot and was a completely different style of game. Elements later popped up in New Vegas, though, which was nice. It's all water under the bridge now, and I'm cautiously looking forward to Fallout 76, but I always wonder what could have been.